OK, kittens. August is nearly over, and you've hardly made a dent in your summer reading list. I suggest you get to it. Edith is showing interest in "Celebrity Needlepoint". She thinks, "I'm a celebrity, and I have lots of needles!" OH! In the 3rd picture Edith looks as beautiful as Twyla did in the same pose. That was ONE of my all time favorites! 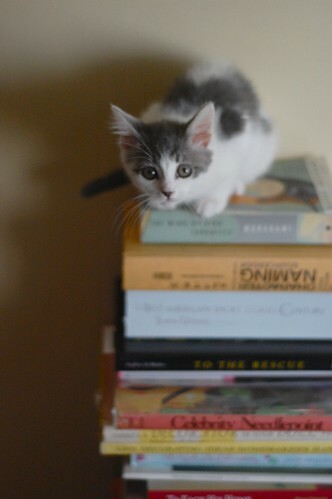 I have a t-shirt with an Edward Gorey drawing on it, of a cat lounging atop a bookpile. The bottom of the t-shirt says, "Books. Cats. Life is sweet." Life indeed looks sweet for the Furmans. Imagine, living in a house with such a tall bookpile! 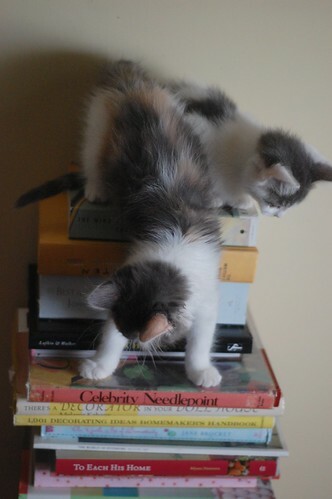 They are going to be so well-read, they will be able to charm any potential adopters with their literary knowledge. I've got the same Edward Gorey t-shirt, elaineofshalott! I've been ordering replacements for years and still enjoy it. Ahhh, two of my favorite things! 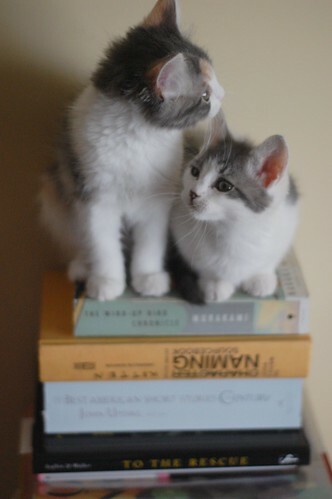 Edith and Teddy look thoroughly educated to me, brilliant little Furmans who have already earned their PhDs in cute. I am not surprised at the reading list... To The Rescue is a book about their early lives, specifically about you, Laurie, and The Bean, and To Each His (or Her) Home is about their future. Perfectly sensible to me. Wind-Up Bird Chronicles is not appropriate for such adorable kittens. :( It'll give them nightmares. It does appear to be an enjoyably cushy perch! Oh their faces have really filled out. So adorable. I just love Teddy's darling little nose and Edith's face is just so sweet. Oh dear, that is quite a list. Alas, my attempts at rereading War and Peace this summer have been sabotaged by my incessant napping-what is a gent to do? In the 2nd photo, Edith is like "So... where do you wanna start, Teddy?" And Teddy: "Huh... I dunno!" They hesitate for a while and, in the end, they decide: "This is too much for tiny kitties!" and "I am outta here!" P.S. Edith's calico floof is so lovely in the last picture! "But, but, mama Laurie, you hasn't taught us to read yet!" A cat on the lap + "Wind Up Bird Chronicle" = a really good Fall afternoon. AHA!! Kitten (aka Character) Naming. . . what great reading for Laurie! :) Good work, kitties! There's a Decorator In Your Dollhouse! I used to take that out of the library when I was a kid! I love Edith's eyeliner, which accentuates her already big beautiful eyes, and Teddy's grey nose! Well, Edith, that last pic makes me think you're interested in Celebrity Needlepoint! Riddle me this, how does a kitty do needlepoint? Better get reading, so you can earn your Pizza Hut Book-It little pizza!!! This adorable series immediately reminded me of the blog entry about the precious kitty pictured in the header, maybe titled "Homeschooled"? WOW! 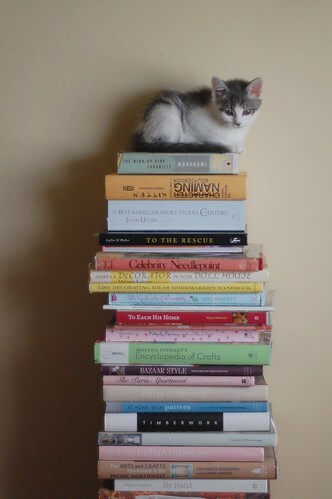 A Kitty-book-tower! We want one! Character...er... Kitten Naming Sourcebook For the WIN!! 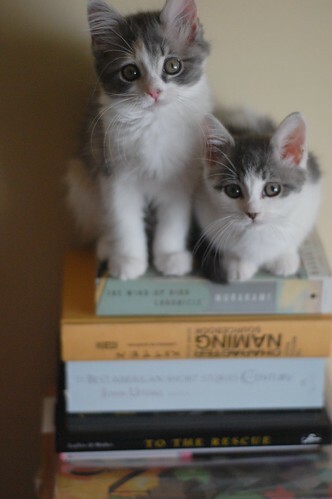 Well, and the cutest kittens on the planet, too. Oh, Teddy, that's kind of ambitious. Wouldn't you rather just chew up the Cliff's Notes? 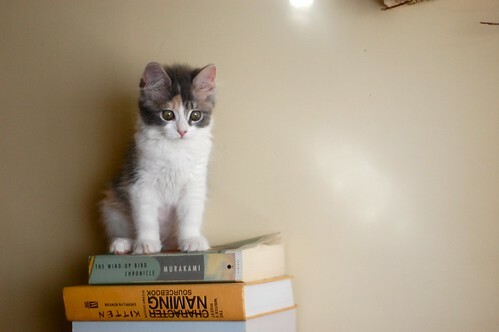 Whenever my cat chews on a book I'm reading, I tell her it's not the Reader's Digest. Although one of my all time favorites, The Wind-Up Bird Chronicle seems like an ambitious read for such youngsters :) How about an audio book? This is my first time to this blog. A friend told me of a couple of blogs that I just had to see. LOVE the pictures!! I do private rescue in the Midwest. As I said on the other blog, I applaud your efforts. This is tough work, but very rewarding. Ambitious list, kittens. Most books around here get read by humans and nommed by the feline resident(s). I love Edith's pretty colours and enormous eyes! I would love to see more pictures of her. you take the BEST kitty photos ever! Loving it! In love the with the cat two doors down!